Because so many people get hurt as a result of the fault of another, getting a personal injury insurance settlement is very common. In fact, only a small percentage of personal injury lawsuits actually go to trial, let alone make it all the way through to a jury verdict. 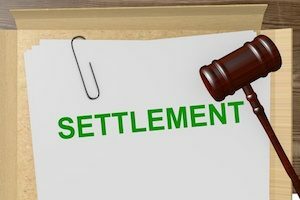 One of the reasons settlements occur so often is because trials are expensive, take a lot of time and are unpredictable. But does the fact that a personal injury settlement involves an insurance company make a difference in how the personal injury lawsuit proceeds? Most of the time, it does. A personal injury lawsuit is a legal action where someone who has suffered a physical injury (plaintiff), sues the party responsible for causing the injury (defendant). The purpose of the lawsuit is for the plaintiff to recover money to compensate him or her for injuries and losses such as medical bills, lost wages and pain and suffering. These damage amounts are usually very high, and the defendant often doesn’t have the money to compensate the plaintiff. That’s where the insurance company comes in. What Do Insurance Companies Have to Do with a Personal Injury Insurance Settlement? Short answer: a lot. The whole point of suing someone for personal injuries is to receive money. Since the defendant rarely has the money the plaintiff wants, the plaintiff will get the money from the insurance company. Of course, the defendant must have coverage through the insurance company, which is usually the case in most personal injury lawsuits. When a defendant has no insurance, you may not even have a lawsuit. The plaintiff knows that even if he or she wins the case, the defendant will be unable to pay. As you can imagine, whoever controls the money has an influence on everything else, even though this isn’t technically supposed to happen. A defendant who caused the plaintiff’s injuries may believe in their innocence and want to go to trial to prove it. But the insurance company knows if the defendant loses at trial, the insurance company will have to pay an even larger monetary award than if the case settles. Not wanting to take that risk, an insurance company might try to persuade its insured, the defendant, to settle the case as soon as possible. Even though this isn’t supposed to happen, it often does. Of course, if the defendant has no insurance and will pay from his or her own pocket, there is no insurance company influence. However, this usually isn’t the case. Most defendants would rather do what the insurance company tells them to do and avoid paying out a large amount of money from their bank account. Learn more about whether could get a personal injury insurance settlement by contacting Williams & Williams, LLC.